On 125 acres about an hour’s drive southwest of Washington, D.C., construction is in full swing on 260,000 photovoltaic panels. In the short-term, the project will create more than 200 construction jobs. In the longer term, it will bring more than $70,000 a year in tax revenue to Fauquier County and provide 20-megawatts of solar power, which, at peak capacity, is enough to power several thousand homes. The project was made possible by a public-private partnership involving the Commonwealth of Virginia, Dominion Energy, and Microsoft—one that could serve asd a model for similar projects. Dominion’s goal is to install 500+ megawatts of renewable power by 2020. Microsoft, which has data and technology centers in Virginia, has a goal to remain carbon neutral. The Remington, Virginia, project is a win for all three. Dominion and MIcrosoft meet their goals with no extra cost to other customers, while the state and its taxpayers have locked-in energy costs. “We saw this as an opportunity to develop solar for our customers and work toward our own goals for generating renewable energy,” said Dianne Corsello, director of business development for Dominion Generation. Key to the agreement were renewable energy certificates (RECs). Because electricity from a wind or solar plant is fed into the grid and mixed with power from other sources, there’s no way for an end user to buy power coming from a particular source. A REC is an accounting mechanism to make sure that one (and only one) customer is credited with purchasing a given quantity of power from a particular renewable source. Microsoft, which has been carbon neutral since 2012, agreed to enter into a long-term agreement to purchase all RECs the project will generate. For Microsoft, the RECs are helping offset the carbon footprint of its data center in Boydton, Virginia, and contributing to the company’s goal of buying enough renewable energy to equal 100 percent of its energy consumption. For Dominion, the RECs purchase agreement means it can sell the power from the Remington plant at a more competitive rate. For the state, a 25-year power purchase agreement will allow it to purchase all the power generated from the solar project for no more than it would pay for fossil fuel-generated electricity. Over the lifetime of the deal, that could save taxpayers up to $1 million. Dominion and Microsoft hope that this could be the start of a trend of creative collaboration on clean energy financing. “I see opportunities for a growing number of companies that are looking to meet their environmental goals,” Corsello said. 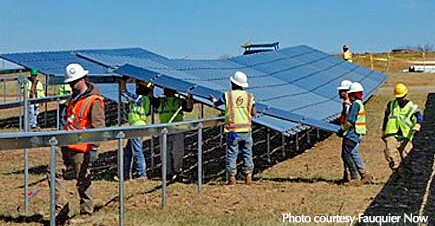 Dominion has invested more than $800 million in solar power in Virginia, with 398 megawatts of solar generation either completed or under development.